I hope you had a safe and memorable July 4th! In Santa Clara County there was not a cloud in the sky which made the conditions optimal for viewing fireworks. 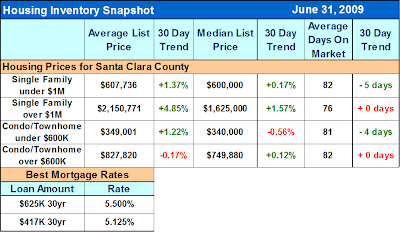 As a comparison, inventory in Santa Clara County is continuing to fall, which is making the conditions optimal for rising prices! - Is it seasonal? YES. Are there still multiple offers? YES. Is the market still recovering? YES. Is 2009 going to be a great time to buy? YES. Were you aware that first time buyers* who purchase in 2009 might qualify for an $8,000 tax refund from the government? Click here to learn more. · Recession till 2010 but getting better the whole time. · All the new lending guidelines are to keep values stable. · 90% of real estate value is in the land. Areas of limited land will rise the fastest. · Rates are lowest in 38 years. Might be up .5% in Q1 of 2010. · $8,000 buyer tax refund is not well known by buyers. She will be speaking again on Thursday July 16th from 9:15 AM -11:30 AM at the Santa Clara Convention Center, Meeting Room 206, 5001 Great America Parkway, Santa Clara, CA. I highly recommend you attend if you are considering purchasing property in the next 12 months. You need to RSVP so please contact me and I can put you on the list, or you can click here for the invitation. Previous Prediction: Expect prices to begin to rise! Well priced properties will sell quickly, and with multiple offers. Interest rates will play a role in buying power and prices, although not as much as it has in the past. Recap: Median list price for homes below $1M has hit $600K! Time on the market is shortening again, which is a sign of multiple offers. Below is the updated chart of sales in all cities East of Highway 880. Now we have seen 11 consecutive months of demand exceeding supply. For Comparison: Here is the exact same chart for cities West of Highway 880, and for the 2nd time in 30 months demand has exceeded supply! Current Prediction: Fewer properties will be coming on the market through the end of 2009. Buyers are going to continue to receive great deals and the threat of rising interest rates will be playing a larger role than the threat of prices going down.